Manage class highlights for in-line comments mode. You can set class and teacher-only highlights to be used in the in-line comments mode. Inline comments are very useful for focusing on a specific part of the text and discussion. However, sometimes, there may feedback that is given repeatedly or more universally (such as "Love it" or "Consider removing" or "Expand further"). You can use our highlights feature for this purpose. 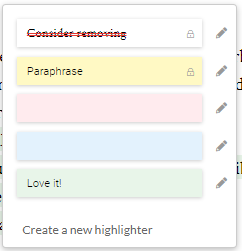 You can make highlights the same way you would an in-line comment. As an instructor, when you are making highlights you can set what meaning of the highlights, add new ones, and lock some for your use only. 1. Go to a student submission and make a highlight. 2. You will be given an instructor-only view of the highlights. This has edit buttons as well as "create a new highlight option". You can use these to change your highlights.